The EuroMillions is Europe’s biggest and most popular lottery draw. It takes place every Tuesday and Friday night in Paris and you can bet on the outcome of the draw with us for just £2. That’s 50p less than you will pay for a ticket elsewhere. Due to UK regulations at Lottoland, you are placing a bet on the Spanish EuroMillions game and not the UK EuroMillions game. Instead of entering the official EuroMillions lottery draw, you place a bet on the outcome and the results of it can be found here. You pick the numbers you think will be drawn in the same way as if you had entered the official lottery draw. Betting with us, you win the amount that you would have won if the official prize fund was shared between you and any official lottery winners. You can also select the QuickPick option (Quick+1) and this will choose a line for you randomly. Once you have chosen your numbers, select which draw you want to bet on, either Tuesday or Friday, and press ‘Place Bet’. This will take you through to a checkout – at this stage just click ‘Confirm’ to place your bet. A single bet costs £2. A bet with the DoubleJackpot feature costs £4. For more on DoubleJackpot please see below. The DoubleJackpot feature allows you to bet for twice the official lottery jackpot. So, for instance, if the official EuroMillions Lotto draw is £50m and you bet on the outcome with us and activate the DoubleJackpot feature, you can potentially win £100m. The prizes for all other tiers will remain the same. You will pay double the price of your normal line to activate the DoubleJackpot feature. So, if you wish to bet on EuroMillions Lotto with the DoubleJackpot feature you’ll pay £4, instead of £2. The EuroMillions jackpot is capped at €190 million. However, you can select our DoubleJackpot feature for the chance to win twice the official EuroMillions jackpot amount. See aboce for information on how this feature works. The EuroMillions draw takes place every Tuesday and Friday night in Paris at approximately 9pm (CET). When you bet on the outcome of the EuroMillions, you win the amount that you would have won if the official prize fund was shared between you and any official lottery winners. You can bet on the outcome of the draw right up until it takes place with LastMinute Bets. LastMinute Bets are available from 45 mins before the official draw right up until the it takes place. Your LastMinute Bets consists of 6 QuickPicks. Why should I bet on EuroMillions at Lottoland? The EuroMillions is Europe’s most popular draw and you can bet on the outcome and win all the same main game prizes with us. It also costs just £2 to bet on the draw, that’s 50p less than you’ll pay elsewhere. In addition to this, you can take advantage of a range of exclusive features such as DoubleJackpot, Subscriptions and JackpotHunt that you won’t find anywhere else. If you’re a new customer, we’ll also give you your first bet free. The EuroJackpot lottery is run by Denmark, Estonia, Finland, Italy, the Netherlands, Slovenia and Spain, with a total population of 130 million inhabitants. The EuroMillions countries have a considerably larger population, at approximately 217 million inhabitants. From a gameplay perspective, the EuroMillions and EuroJackpot lotteries are similar; both lotteries require you to pick 5 numbers from 50, and 2 supplementary numbers. 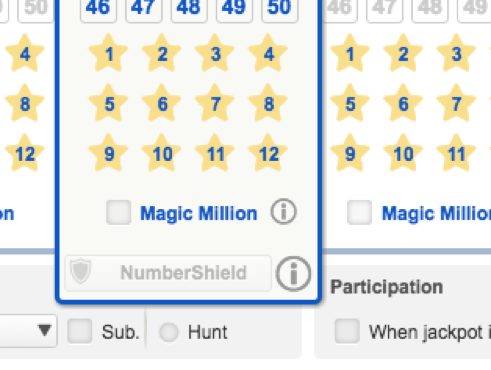 The supplementary numbers are where the difference becomes clear as you must pick 2 supplementary (Star) numbers from 8 for the EuroJackpot and for the EuroMillions you must pick 2 supplementary numbers from 12. The EuroJackpot organisers guarantee a weekly minimum jackpot of €10 million, with a maximum jackpot of €90 million. The EuroMillions is much larger in comparison, with a minimum of €15 million available at each of the two weekly draws (i.e. €20 million weekly), with a maximum jackpot size of a whopping €190 million! Magic Million is an exciting scratchcard game, that’s available every time you bet on the EuroMillions at Lottoland.co.uk. Just tick the Magic Million box after picking your numbers and for just 50p extra you can take the chance to win £1 million! Plus, there are many more big money cash prizes up for grabs! Go the EuroMillions betslip and for each line simply tick the Magic Million box after you’ve picked your numbers and, once you’ve paid, your Magic Million Scratchcard will begin automatically. Match 3 symbols to win the corresponding cash prize. Match 3 1Mil. symbols to win £1 million. Magic Millions has a top prize of £1,000,000, and other prizes ranging from 25p all the way up to £100k! 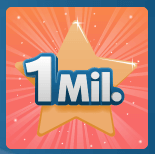 A Magic Million game can only be purchased with a EuroMillions bet and costs 50p. If you successfully match three symbols a congratulations message will appear notifying of your win and the value. Match 3 symbols to win the corresponding cash prize. Why does it cost 50p less to bet on EuroMillions than it does to buy a ticket for the official draw? It costs 50p less to bet on the EuroMillions at Lottoland.co.uk than it does to buy a ticket for the official EuroMillions draw, because our betting model gives us the freedom to set our own prices and offer our players added value.